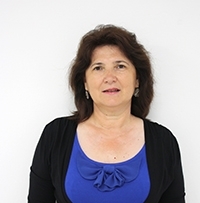 Since 2005 Mariana Matache has been the founder and president of Asociatia EURO ADULT EDUCATION (former Asociatia ‘EUROED’), a national NGO that specializes in Adult Education projects and Vocational Training courses in Romania. She has established and developed this association from inception. The NGO has a national and european-wide network, has coordinated and implemented over 30 European projects, and has offered vocational training to more than 5500 people. Mariana Matache conducted strategic projects founded through the European Social Fund, as well as other European projects in collaboration with various international partners. The key areas of expertise are designing and implementing national and European projects such as “The Citizen comes First” and “Counseling, professional training and assistance for businesses in rural areas – FAR”, and leading civic education and project management seminars. In addition, for the past two years, Mariana Matache has worked as a key expert in the Republic of Macedonia in the frame of the project, “Enhancing Lifelong Learning through modernizing the vocational education and training and adult education system – Europe Aid/135834/IH/SER/MK”. She reforms the Adult Education systems in Macedonia according to the European standards. Among others, she coordinates the development of the Adult Education strategy and of the Lifelong Learning strategy (which is being created for the first time). In 2013 Mariana Matache was elected on the Executive Board of the European Association for the Education of Adults, where she brings in her expertise of development and implementation of Adult Education in Central Eastern European countries. Since 2015 she is also an Advisory Board Member of the European Business Competence * License (EBC*L). I want to increase awareness in Romania about adult Education, lifelong Learning, and European policies and influence stakeholders about the importance of Adult Education at European level. I also want to be up-to-date with the novelties in adult education at European level in order to implement them regionally.